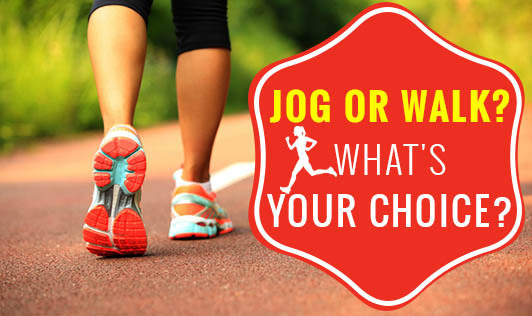 Jog or Walk? What's Your Choice? If you run for 30 minutes, you will burn more calories than walking for 30 minutes. Reason is, heart rate while you run is higher when compared to walking, obviously increasing the oxygen consumption leading to calorie burning. However, if you walk or run for the same distance, the calorie burnt is equal, but the time consumed for walking is more than running. Running/ jogging definitely leads to faster weight loss. Walking is no less. But make sure, you walk for an hour, five times a week. Remember, running/ jogging pose higher chances of injuries like knee pain/ shin pain as the intensity is higher whereas, walking is gentler and especially recommended for people with joint pain and thus leads to lesser injuries. Results of exercises vary from person to person. Choose the exercise that suits your physical condition. Most importantly, indulge in exercises that you enjoy doing so that you will not deviate from your health goal.